This weekend: GRUB food fair relaunches at Fairfield Social Club. 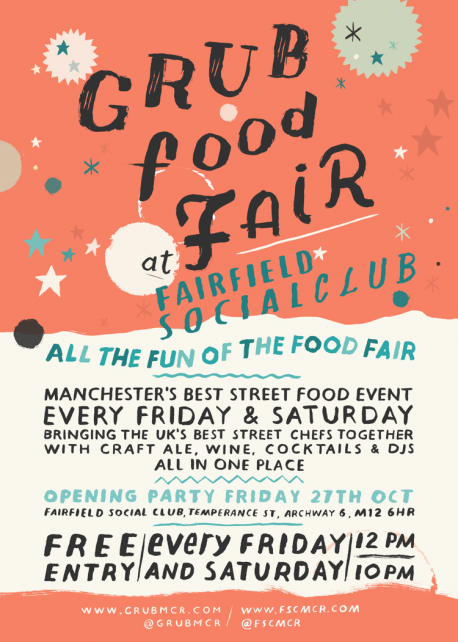 GRUB Food Fair and Fairfield Social Club’s new venture is full steam ahead, opening this weekend at the new venue. It’s a five minute walk from Manchester Piccadilly train station, and all undercover. On Friday, The Gravy Train Poutine, Howlin’ Tacos, Diamond Dogs, The Otto-Men and ChouChoux are the street food line-up. The Gravy Train Poutine and The Otto-Men are back on Saturday, and joined by Wallace and Sons, Pastrami NOW, South Manny Flavaz and Fruits of the Forage – all food trader details are available via the link below. DJs are playing all day and a full bar of local beers, sodas and wine will be flowing. Head down to celebrate their arrival.